I arrived at about ten to eight; no one there. Good I thought, I’ll have time to mount some targets and plan a course of fire. But the river kept me transfixed as it gurgled by, it was a beautiful day and I began to think it would be cool if no one showed. Then my friends Dan and Joanne drove in. Always good to see them. I started wiping the fiddling table of water and grit. We soon had targets up as we chatted about new taxes, life, babies and the great winter we’re having. 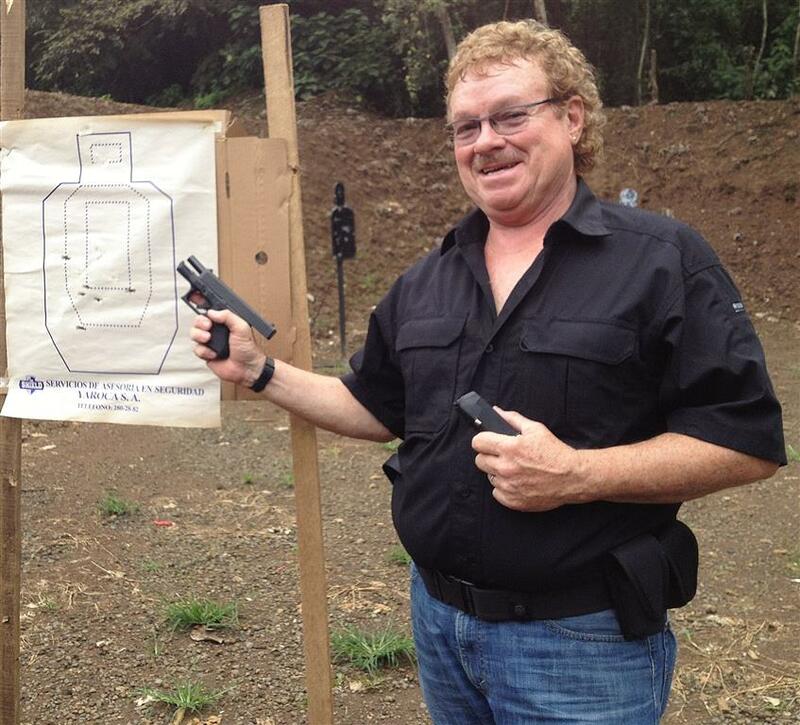 Finally Greg arrived with his new Smith & Wesson M&P Shield from “Hurican” in Alajuela (who also sells Mil-Comm Products). So we shot till we were out of ammo. We played with my laser sight but it wasn’t bright enough. I suppose those green ones are better but I’ve never seen one. The trick is to keep the surprise factor going for the shooter. If we make out a dance card and everyone steps right, shoots the closest target and moves to cover over here; what happens if a target not on the sequence suddenly lights up and begins firing? In a real fire fight there are people trying to flank you. Everything is moving and we should train for more surprises. There are some very expensive ways to make this happen. I want to do it cheap. Suggestions are welcome from the club. Speaking of the Club, if someone wants to make up a course of fire, please say so and we’ll talk about it. One day after the rush of high season is over, we’d like to invite you to a 5:00 p.m. to 6:30 or 7:00 p.m. dusk to dark shoot. 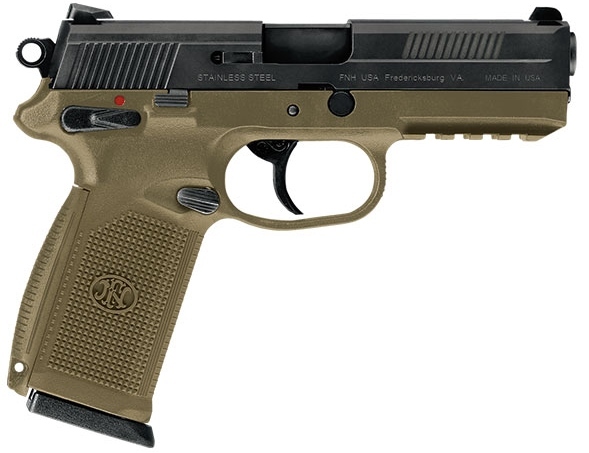 CONCEALED CARRY DAY: Everyone please come concealed. 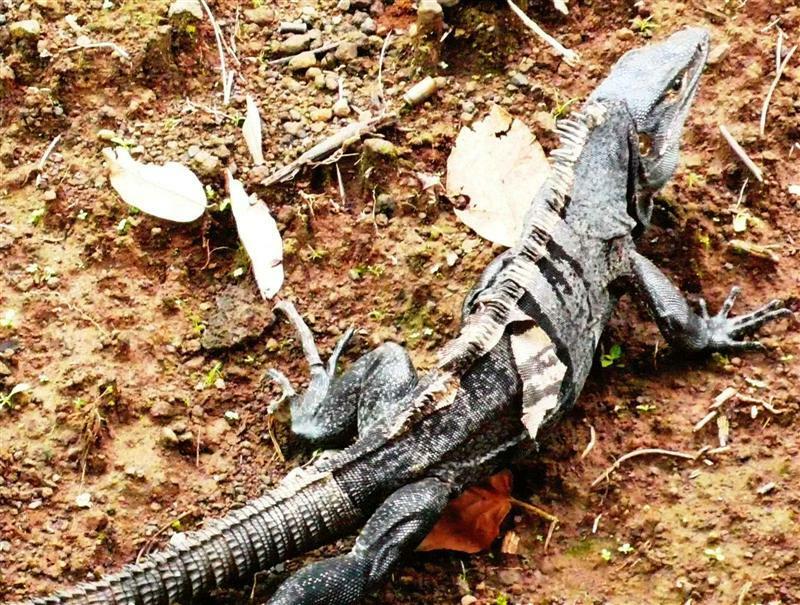 Your weapon must not “print” or bulge and you must be attired for Costa Rica, not Alaska. Gun must be accessible and quick into action. 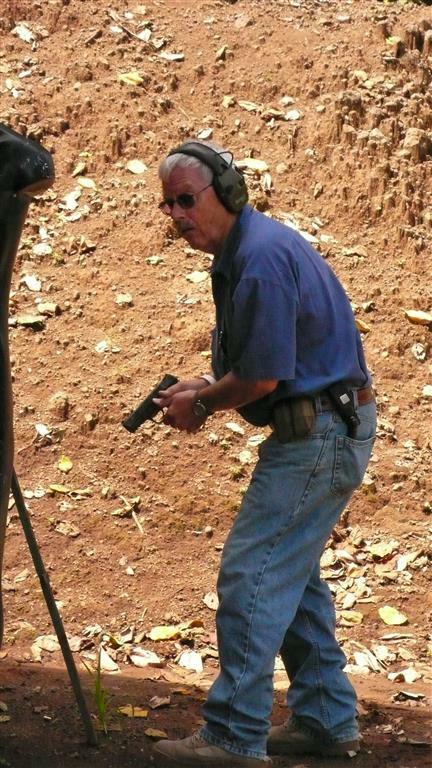 Magazines in back or front pocket are okay. Must NOT be accessible to a guy walking behind you. 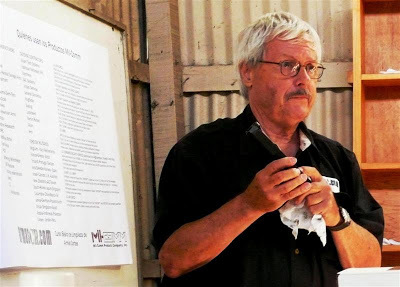 My cousin Gordon, a new NRA instructor and Retired CEO of Mil-Comm Products Gun Care Systems, here on sale at La Garita Pistol Range and Roberto Vargas Hardware in Atenas. Also available at better gun stores. Cousin Gordon, his wife Carrie and son Jason Furlong came to visit a couple weeks ago. They played their guitars, sang and had a mini tour of Costa Rica. 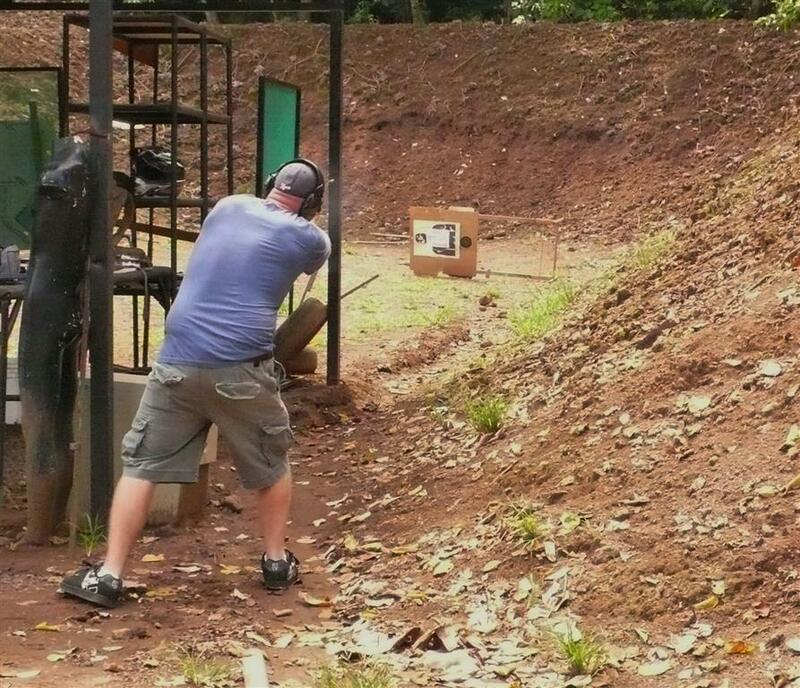 I took them to Poas, Jaco and naturally La Garita Pistol Club for a little target practice. This was the day they would turn in their car and stay near the airport for an early flight. We were finishing up the last thing we wanted to do this trip. Carrie Furlong, the brains in the outfit who made tight groups from the start.. Gordon didn’t marry no fool…. 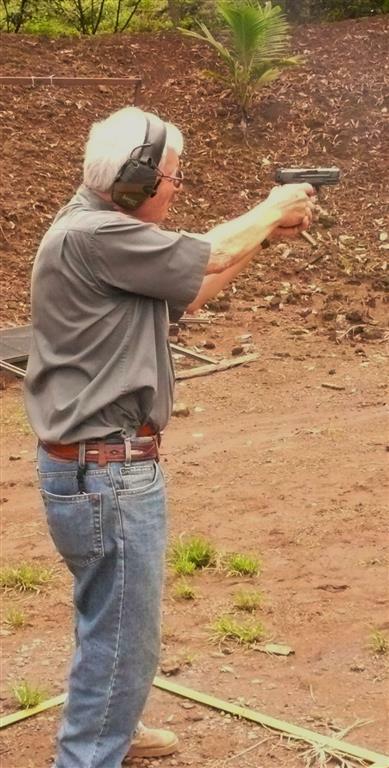 My nephew, Jayson Furlong took to his gun like he’d been shooting all his life. If he ever gets as good as his guitar playing, the world around him will be a safer place. “This is where our finger goes”… building in muscle memory takes time. I wish I had him for a week. 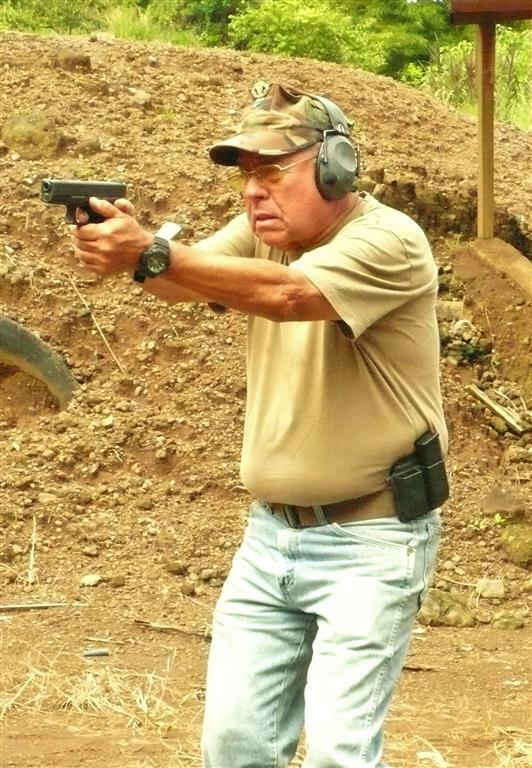 LA GARITA PISTOL CLUB MEETS THIS SUNDAY!!! This Last Sunday of the Month there were 6 of us Shooting. What fun! 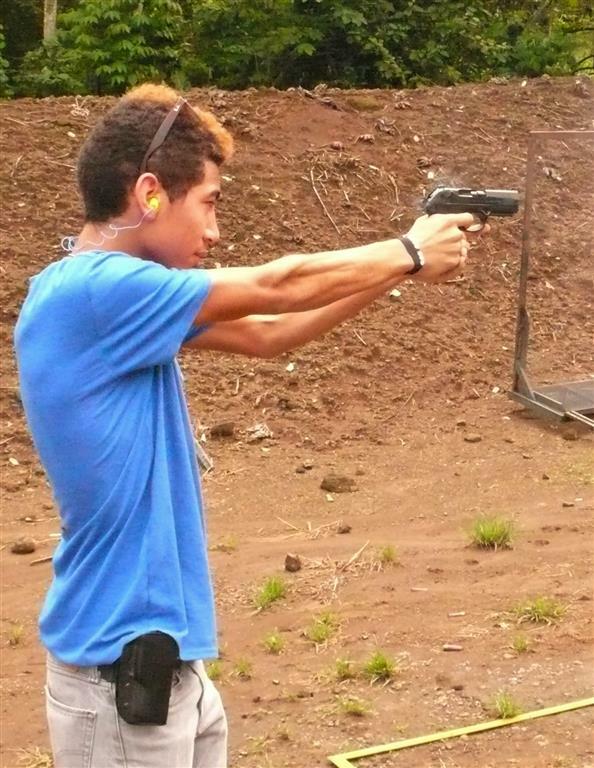 Enrique with his Glock 40 cal. It was good to have him Shooting with us. I asked Enrique if he felt like making a course of fire for our Monthly La Garita Pistol Club meeting. He said, “Sure.” So I had no idea what he had in mind when I arrived a few minutes before 8:00 on Sunday. Soon we were setting up targets and positioning them where he wanted. He explained a few things he’d learned recently and added them to our course of fire. There were two brothers, a couple and Enrique and me. Wait…. there’s more! Silvia kept us civil and worked on her game. Dan shot with his new Smith M&P from EPM. They also sell Mil-Comm Products. Check them out! With the price of ammo and the time I take off from quiet Sunday mornings with my wife; I try to keep these meets to 50 rounds but it tapers off till one by one, we run out of ammo. Over the last couple years, I’ve seen new groups meet, become friends and drift off back to busy lives. It’s fun when a few of us meet the Last Sunday of every Month and enjoy each others company. I didn’t shoot particularly well this day but I’ve had great days and medium days all my life; I guess that’s life. I guess LIFE is why we work on our game; this is a Defensive Pistol club, after all. But it’s become a sport for most of us too. So if you want to improve, practice your dry fire diligence and come to these meetings whenever you can. Younger Brother Issac, never stumbled; he’s just swift and accurate. Older Brother Dillon; serious, smooth, fast and got good hits. Their father’s no slouch either. Me, doing my level best to remember which target to shoot next. It’s amazing the wildlife we see at the range. 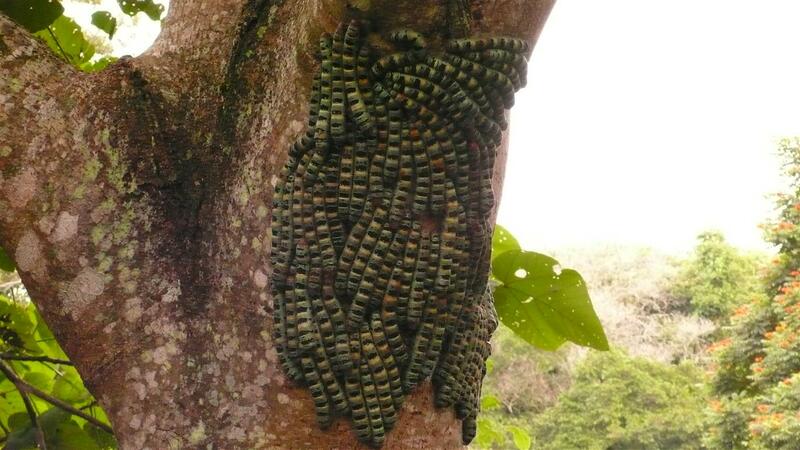 Soon to be butterfly’s, all of them incognito. As I’ve said before, we teach the same kind of humility that martial arts does. We don’t want our graduates posting warning signs outside their doors or showing their neighbors their new guns. 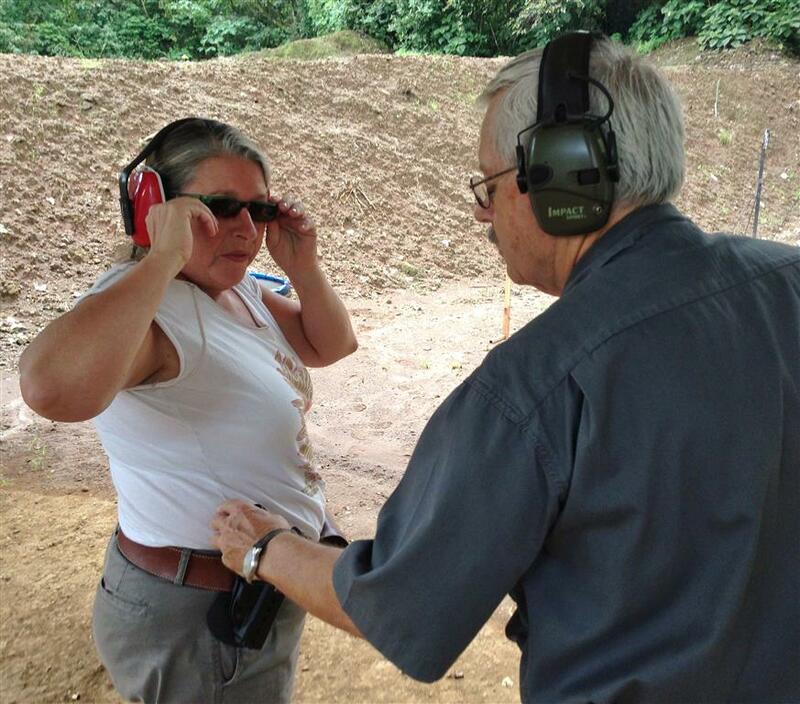 A handgun is a last resort device that will save a life in skilled hands. If thieves know you have guns, they’ll come for the guns. When they get there, they may just shoot first if they think you’re armed. 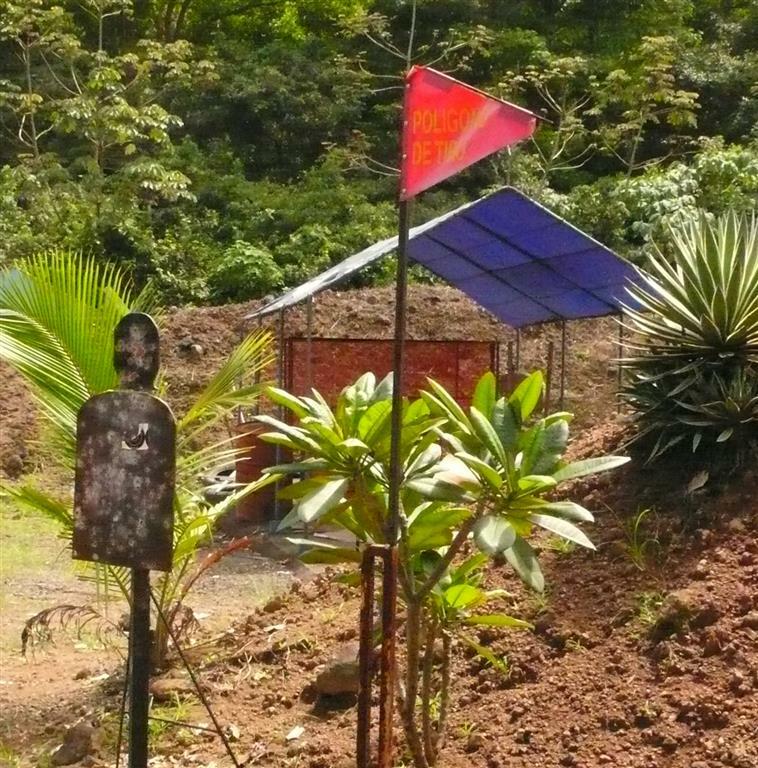 Every student and everyone who shoots at La Garita Pistol Club gives his full name, passport or cedula number and we take the numbers of his gun. Everything is then sent to Ministario de Seguridad. So if we have a “Brown Bag Special,” it is at the student’s request and for his own security. Just so you know there’s no funny business going on. This was a laid back Sunday with only three of us. And we had fun. We had the range to ourselves that day. 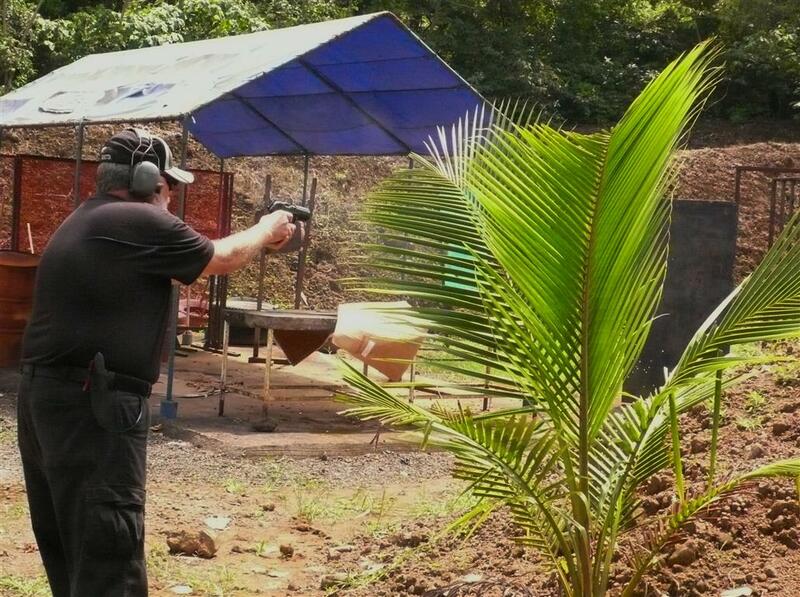 With Enrique’s permission, we used two ranges and set up targets in different places for each shooter. The idea was to surprise the shooter with new positions. We measured hits, but there were no limits on rounds fired. Reload when necessary, tactical reloads impressed the judges (both of us). Shooter #2 has just drawn his weapon and begun engaging targets. We didn’t measure time except if a person was too slow to react or showed himself to hostile fire longer than necessary. Then we might call him a great shooter, but a dead great shooter. It was all subjective and each of us pretended there was really a bad guy out there. The use of cover, flanking movements, anything was fair game as long as our guns were always pointed downrange. Shooters were required to holster their weapons between ranges. Throughout the exercise, shooters were expected to keep checking behind them, above the ridges of the berms and not fix on their targets. It brought back the days of cowboys and Indians we used to play as kids. Shooter # 1 has been working on his game for some time and it showed. That’s me, number 3. What fun. That’s it, not too many pictures but we shot a lot and sheared ideas. That’s what friends do. Come join us Sunday, the 27th. See you there! My daughter Andre and I in the beginning. She now has her own carry permit and I’m proud of her. This is where the news will be. we hope the change to our new location will justify the time we’ve spent doing it. This is how it all began over two years ago. I’d forgotten how emotional my wife is. 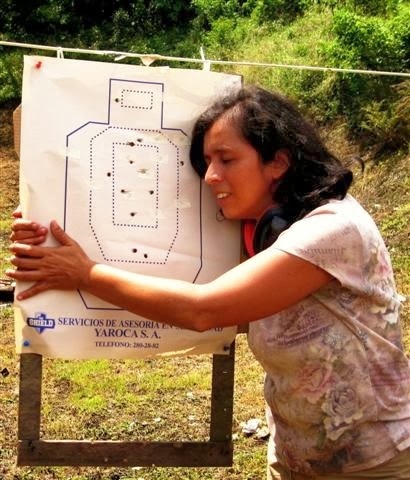 As you can see, she loves shooting. Perhaps if you bring your wife, she’ll be happy too! DON’T DO THIS AT HOME, staged by professional actors and experts in the field of Defensive Pistol-craft. Meanwhile our new site is going up and can be viewed at https://shootingcr.com/ Please visit us and make suggestions if you like. We hope to have more options and reach more people. 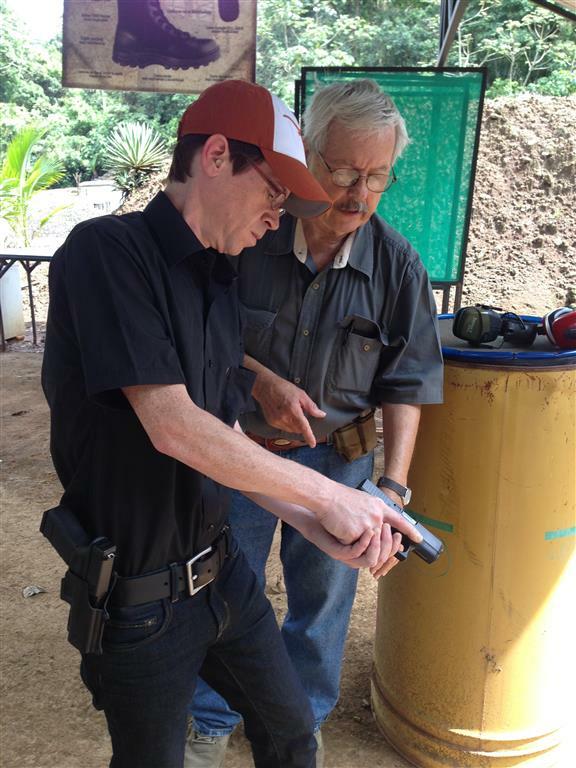 You can still visit us here, we hope you do, and keep us informed about what you’d like from your Pistol Club in Costa Rica.